Do you remember the last flying dream you had? The green cliffs far below you, the ocean only a faint roar, and the air blowing through your hair. Everything is slow, and just the right speed. There is no fear. Thats how I feel these days, being pregnant. Except, instead of flying, I feel as though I am swimming in warm, still waters. The way is clear, but I cant see the point at which I will surface. I dont want to know it yet. Being under the water, and moving my arms and legs like a guppy, Im smiling in a primal state, deep inside myself. Theres someone else inside myself. Someone is swimming with me, and I am trying to bring us to shore, slowly. Life has become much quieter these days. Oh, I am teaching cooking classes, sometimes with the Chef, nearly every week. Standing in front of people, asking them to share their stories while I demonstrate how to make gluten-free bread, leaves me happy, and exhausted. I have days that leave me on the town for hours, meeting people for lunch, running errands, writing in coffee shops. Those days of energy, I carry Little Bean with me everywhere I go, and pat my belly while I listen to someone else talk. But as I move through the grocery store, I think more about what to make us for dinner than the little being growing inside me. But on more and more days, I am at home by 4, shutting the door on traffic from the freeway, things I should do, places I could go. The light gathers on the hardwood floor of the living room, and I curl up on the couch and lay my head down on the pillows. Sometimes, I nap. Not nearly as often as I did that first trimester  that was three naps a day. Instead, one brief release into sleep leaves me rested for the rest of the day. But even after the nap, I move slowly. I walk over the clutter on the living room floor and enter the kitchen. Im hungry. A small ball of fresh mozzarella with Maldon salt. The red bowl full of rice. A cold glass of milk. It doesnt take much to satisfy me these days. Just enough to fill my belly, a belly that is already fuller than I have ever seen it. I write, sometimes for hours. (And there is some juicy news to share with you soon, the reason I am writing far more than shows up on this site.) But the prickles start in my wrist, and I fear that Im starting into carpal tunnel. So many friends have told me stories of their hands seizing up toward the end of their pregnancy that I raise my hands above the keyboard in surrender at the first sign of stiffness. It really is about surrender these days. 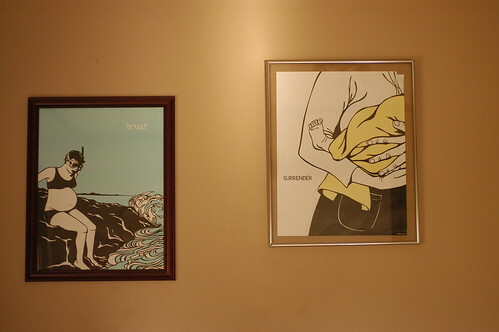 These two prints in the photograph above are by the amazing Nikki McClure, whose keen eye and kind heart move me every time I see her work. On the left, trust. On the right, surrender. These two hang on our bedroom wall, and I look at them every day. Ive never been through this process before. If this had happened ten years before, I would probably have been filled with fear and hourly trepidation. But for now, I simply know to trust: my body, the time passing slowly, and the days when I need to simply surrender and do not much. Surrender is such a dirty word, in some peoples minds. But surrendering to the slow moment? Thats where discoveries come. Last week, I made crème fraiche from scratch. Before I went gluten-free, and before I met the Chef, I would have thought that was impossible, not to mention crazy. In fact, Im not even sure I knew what crème fraiche was, until after I had removed the gluten from my life. It was one of those fancy foods that felt far beyond my reach. However, on my first taste, I was left hungering for more. Thick as pillows punched down on the bed, slightly tangy but not as lip-puckering as sour cream, crème fraiche lightens and smooths, removes the bitterness from foods with one swirl of its sweet creamy self. It doesn’t curdle, but remains as attentive as morning light just after dawn. After I discovered it, I began to dollop it on top of fresh strawberries, or stir some into chicken dishes for sauces. And of course, when I met the Chef, I embraced crème fraiche too. Hes classically French trained. Hed been working with it for decades. Still, it wasnt in our home that often, because of the exorbitant prices that grocery stores charge. I passed by it in the dairy aisle, looking back in longing. Another time. Two weeks ago, I made butter for the first time. Yes, thats right. I made butter. Yellowy, fresh butter, which stayed soft and slathered itself on bread. For days, I walked around in a daze. I made butter, I kept saying to the Chef, who kept laughing. But he didnt understand. Having grown up on margarine tubs, and only graduating to the real stuff well into my thirties, I never imagined I could make butter. Butter! These slow, soft days all seem to be leaning toward making me more domestic. (Well, maybe not with the housekeeping.) Were going to start a garden soon. I still want to learn how to sew. We walk hand in hand through farmers markets, and I take fewer photographs and bring more bags home. And Ive started feeling like an Amish woman (with a KitchenAid): I made butter. What else could I do on the next slow afternoon but make crème fraiche? It’s so amazingly simple to make. Find some really good cream (Im ridiculously partial to this one). Let it sit out for a bit, so its not cold anymore. (But not too warm, either.) Letting it come to room temperature may be hard these days, but its worth the effort. Combine the warmish cream and few tablespoons of buttermilk in a small saucepan. Heat the mixture until it is about 85°. Pour this in a jar. Put on the lid. Let it sit in a warmish place for a day or two (more if its cold in your house). Stir it every day. One day, youll lift off the lid, put in a spoon, and let out a gasp. Gosh! Crème fraiche. Im sure well be doing plenty of science experiments with Little Bean one day. This feels like a good place to start. Slow, low, swimming and sliding through the days. Life is moving within me. Its moving without me too. These are good days to spend hours making a food I have never attempted before. After August, there probably wont be much time. Of course, there was the next question: what to do with the crème fraiche? One of those slow afternoons, I came home and peered into the refrigerator. Glimpsing my latest creation, I grabbed the crème fraiche and decided to make something up with it, on the spot. My tastebuds remembered a lemony crème fraiche sauce over chicken I had made many times before, based on something I read first on Luisas site. In the first weeks of our relationship, I made some for the Chef, and he approved. But I didnt want chicken. I wanted pasta. The first trimester may have meant all protein. But this trimester includes some starches, too. Rice, of course, abounds, once we bought the rice cooker. But lately, Ive been wanting pasta. 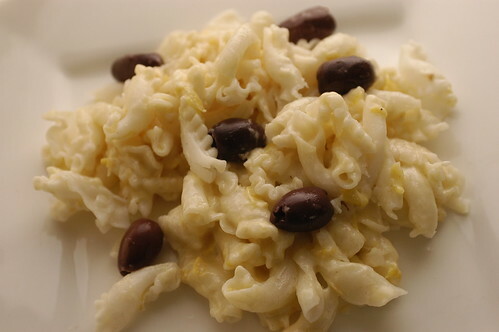 My favorite gluten-free pasta of all time is a rice pasta from Italy, called Il Macchiaiolo. Soft and pliable, with a long stretch shape to hold sauces, this is impeccable pasta. Made by artisans, Il Macchiaiolo has been brought into the US by the good folks at Ritrovo. Ilyse and Ron bring beautiful foods from Italy, mostly organic and certainly made in the tradition of grandfathers on the same land, to us lucky enough in the US to find them. And to my surprise and honor, they recently asked me if they could put a sticker on the packages of the rice pasta: Recommended by the Gluten-Free Girl. Of course. This means that when I go to a grocery store here in Seattle, I reach for the rice pasta, and then stop. I laugh. This cracks me up. Recommended by me, bought by me. Really, I do recommend it. And so, with a jar of homemade crème fraiche in my hand, I began heating and stirring, making it up as I went along. Lemony singing with homemade butter, creme fraiche nuzzling in, adding another harmony. This is slow afternoon food. Ive eaten this dish three times this week. I think youll like it too. Slowly, heat up the butter until it has melted, but is not boiling. Throw in the lemon zest. Watch the little yellow curls dance. Add the lemon juice and bring it all to a lovely simmer. Dollop in the creme fraiche and stir. At this point, the sauce will be delicious, but it might be a bit thin. If you wish, mix up the potato starch and water in a glass to make a little slurry. Splash in a bit of the slurry at a time, and then stir the sauce. Pretty immediately, the sauce should start to thicken. Stop before it becomes paste. Toss this with the prepared pasta of your choice. Feeds 1 (well, perhaps 1 and 1/2). Double and triple if you want to feed more. Suggestions: lately, I’m loving this with olives. (What don’t I love with olives right now?) But when asparagus season hits, I’m going right for this with roasted asparagus tips. Artichoke hearts would be delicious. So would be a little crab. Try whatever food you like with lemons. Oh, and goat cheese on top. This looks so lovely . . . but more importantly, OH MY GOSH, YOU’RE PREGNANT! I mean, I get a few colds, my dog gets sick, I fall out of the routine for a while and when I come back, you’re PREGNANT! That is just so utterly spectularly marvelous I don’t even have words for it. Congratulations to you, The Chef, and the bean inside you. And . . . can’t wait to hear what the writing news is. Thank you for your sweet words on swirling notions about our pup. I, too, have been practicing surrender as I adjust to him not being here. I’m trying to surrender to the elephantine waves of grief when they hit and just let the tears flow; not always easy when you feel, in the moment, that they’ll never stop. But in the end, even this just proves how very precious and beautiful life is. Big hugs to you! I can’t wait to share mommyhood with you! Where, oh where, can I buy Il Macchiolo pasta? Is it available online? Allergic Girl also recommended this brand, and I am desperate to find non-cardboard-tasting gluten-free pasta! How is it possible that the cream just doesn’t spoil sitting out on the counter? You’ll have plenty of time after August to get things done. Don’t let the horror stories scare you (first rule of parenting: other parents like to scare new parents. It’s like a rite of passage). It’s true that you’ll be busy in a way you’ve never been before, but babies (especially one baby) are flexible. They sleep a lot in the beginning, as I’m sure you know. And when they’re awake they like to be in a sling with mom or dad. I did everything with first child in a sling or Bjorn although the time I caught myself in a sleepy haze frying a chicken, I quickly realized I might have pushed it too far. I’m sure you’ll be one of those moms who multi-tasks well. Of course, a babysitter is nice now and then too. Shauna, I got a kick out of this story. We’ve recently started making our own yogurt, and my initial reaction was the same as yours when you made creme fraiche- every few hours, I would look up and go, “hey- I made yogurt!” Homemade is ALWAYS better! Try B vitamins for your carpel tunnel, after going gluten free and treating my sleep apnea vitamin B is the best thing I ever did for myself. Thanks for your site. I just finished your book and it was lovely and so like my experiences, except where it wasn’t. I even had a car accident around the same time you did! Keep up the good work, here, with little bean, in life. and guess what I have in my fridge. Buttermilk and good cream. Thanks for posting this. Your food stories are so interesting and poetic. I just wish you would start a gluten-free magazine for all of us already!!!!! The way we make Creme Fraiche is even simpler. One cup of good cream, 1 Tbsp of buttermilk, shake it up in a glass jar, pop it up on top of the fridge for 24 hours and voila. So good. Take a Medjool date (or a Turkish Fig), dip it into some Creme Fraiche … soooooo goooood. 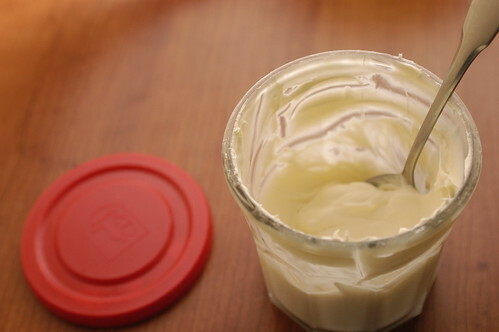 I made butter in fourth grade (it was a thrill), yogurt in college (equal thrill) and now that I’m retired, I’m definitely going to try making my own creme fraiche! thank you! But, what do I do with the rest of the buttermilk? There is nothing better than the awe of making something so utterly regular, like butter, or creme fraiche. This past fall I spent an entire day rendering tomatos to tomato paste. Yes, all day long, well over 10 pounds of precious fall tomatoes and I ended up with a scant quarter cup of thick, over the top tomato paste. I carried on and on for days about my accomplishment, I was so delighted with myself I could hardly stand it. And, you can bet I will be making it again this fall. Such a thrilling adventures we have and I agree with Chris, you will have wonderful, long days well past August to delight in little bean, cook, create and just be! Well, that’s it. I’m going to have to make some Creme Fraiche. I like the idea of leaving it on top of the fridge…my flat isn’t very warm these days! That art of yours is beautiful 🙂 and how appropriate! “Juicy news to share” ?!? Oh, do spill! Book #2? Please let us share in your excitement! I made a creamy pasta years ago for some catering clients. I tossed hot pasta with cream cheese, then added yellow, red and orange cherry tomatoes (cut in half,) green onion tops and fresh basil. Topped it off with a grated hard cheese, a salty one. I’d picked all the fresh stuff from my garden. It was yummy! Of course, creme fraiche would be BETTER! After searching about 10 health food stores, I finally found some heavy cream with no carrageenan just an hour ago. Yahooey! I don’t have to get my own cow after all! Here’s my garden tip: Sungold orange cherry tomatoes are my favorite. Juliet (small Roma, about 2″ long) are always my first to ripen and my last to stay on the vine, and they don’t crack or split. Off the subjects, I’ve been searching for a powdered sugar made without cornstarch. Have had no luck. Have you run across such a product in your food adventures? Oh wow, with asparagus this would be so good! I’ve never given much thought to how the sauce sticks to the pasta, but I will now. What a lovely post about being pregnant. I have a 9 and a half old daughter and it has been such an incredible, challenging and wonderful experience. Many, many congratulations and best wishes! I, too, love Nikki McClure’s art. Wishing you only the best (and lots of rest) as you navigate the last months of your pregnancy. You sound so beautifully pregnant with so much more than child. Catherine Wagner, ed. ; Rebecca Wolff, ed. Heard of this on NPR today…not for the faint of heart, no worries here. Just wondered about the buttermilk you added to the cream. There is buttermilk here in the UK, (you would know, you’ve lived here!) but is it the same stuff? It contains vegetable oils and other goo and things… would that make creme fraiche of the finest kind? I love the stuff and I can only imagine what my dear Wookiee would think if I held a jar with homemade stuff before him. Life ain’t the same no more! Now this is weird! at the same time you made butter …we made butter too! and yes we giggled our butts off with the we made butter thing too! only we stopped right at the point of almost butter and then put the creame on top of our Irish Coffee! I checked into the Il Macchiaiolo pasta? It’s more than $9 for a 1.1 pound bag! Yikes! Not for the commoners, I guess. I’ll stick with Trader Joe’s rice pasta–organic, and $2 per pound. I have been reading your blog for a while now, and I really love it. Both your posts and your style of writing. Now, I’m neither gluten-free, nor an expert cook. I just love trying different traditional recipes and also experimenting with them. The thing is, when you read one’s blog for a while, you develop a sense of friendship (or cyber-friendship maybe) toward them, which is interesting and unique. I may not know you in person, but I feel the same for you as for my friends. You mentioned that you are more into rice these days. I have this old traditional recipe for a persian dessert that my grandma used to make for me all the time and I loved it. I guess it should be similar to the “puddings” category but what makes this special is the “Rose-water”. I think you can find it in any Medditeranian store or Arabic grocery store, or Iranian ones, if there is any in your area. Put milk in a pot, on the oven, high heat. Add rice flour and dissolve it, until there is no lump. Add sugar, which will be dissolved fast. Dont let the milk come to a boil. When you see the bubbles starting to form, bring the heat to med-high, and keep stirring in, 15-20 minutes, until it thickens slightly. Add Rose-water, stir a couple more minutes, turn off the heat. qI love it! There’s nothing better than fresh homemade butter (I grew up off the grid in Eastern WA and we made butter from the milk we got from a sweet little Jersey cown)…unless it’s creme fraiche. Mmm. Or unless it’s fresh mozzarella. I read Animal Vegetable Miracle last summer, and got inspired to make mozzarella balls. Not exactly the same as the lovely buffalo mozz, but quite delish nonetheless. Enjoy your quiet slow times, soon enough they will be interspersed by bits of the most incredible sweetness as you breathe in the smell and softness of the LB…. Not to burst your bubble but if you’ve ever accidently over whipped cream (not the ultra-pasturized kind)to the point where it separates/curdles you are three quarters of the way to making butter. Simply knead/squeeze out the excess milky liquid (true buttermilk as opposed to the cultured kind you buy at the supermarket) and there you go. Also, making creme fraiche doesn’t require heating anything on the stove. All you need to do is add 2 tablespoons of buttermilk to one cup of non-ultra pasturized heavy cream, cover it and leave it at room temperature for 12-24 hours until it thickens when stirred with a spoon. If it hasn’t thickened by then simply add a drop or two of lemon juice and voila. Store in the fridge for up to 2 weeks. Wasn’t it Madeleine Kamman who said huffily, “Creme fraiche cannot be made”? “A ridiculous waste of time,” cows not the same, grass not the same, bacterial fermentations not be the same as in France,” etc. Maybe she was having a bad day, or maybe things have changed since “When French Women Cook” was published in 1976. Good for you for doing it anyway. Re: being pregnant. Congratulations. A word of smug but wistful advice: all the old ladies are right. Yes, the time will pass in a blink. Enjoy it. My first Little Bean will be 18 in a few months. Somehow there really wasn’t time to save for college …. Yum! I’m making creme fraiche soon! As for corn-free powdered sugar, as well as gluten-free blintzes & soy-free chocolate, this is the time of year to look! Passover foods are coming out in grocery stores and kosher markets around the country. No corn, no soy. And while many baked goods are made with “matzo meal”, others are made with nut meals and potato starch instead. “Ring Things” are a gluten-free ring ding only available in the Kosher for Passover aisle! The powdered sugar might not be available except in the most-Jewish of areas, but it’s out there. After you have your child, could you make us a small promise? Could you keep this blog about food? If you are so enamored of the process of birthing a child– and it is, by its very nature an all-consuming process– that you want to write about it all the time, could you start a separate blog where you can recount all the wondorous experiences of first-time parenthood? It would be so depressing to see this lovely food blog turn into just another Mommy Blog that chronicles Junior’s every action. Many parents don’t realize their kids aren’t nearly as interesting to everyone else. Hm. Well, that seems pretty rude to me. I have a feeling I won’t be writing about our child all the time, because we want to protect Little Bean’s privacy. however, writing is always an act of discovery to me. That’s why I keep going. I have no idea what this site will feel like a year from now, the same way I couldn’t have predicted all the ways it has changed already. I will write what feels right to me. And if you don’t like the turn it takes, of course, you can always read somewhere else. I made your lemony pasta the other night, and i have to say, i am officially addicted! thanks for the lovely dish, i have already had it three times this week. ah, the internet, giving even the greatest coward cajones enough to speak their mind while hiding behind the great “ANONYMOUS” sign. To you, Mr./Ms. Anonymous, I say, THBBBBBBT. The same beautifully free internet which allows you to taunt without fear of repercussion also allows all of us to write about whatever we damn well please. If you don’t like it, well, there are plenty of other blogs to read that won’t offend you so. Shauna, I started making my own butter with my KitchenAid several months ago, and I LOVE it. I wish I had a source for fresh milk/cream (alas, all our local dairies are on the other side of the city, hours from where I live), but even with storebought pasteurized cream it is so much better than “store butter.” Oh, happy day. And, you keep writing about what is important to you. I am going to go make that yummy pasta now. I would read some labels, though, because if the stuff you’re looking at has vegetable oil in it…I dunno, that is weird. If you can’t find it, google “buttermilk substitute” – I haven’t personally tried them so I don’t know how close to the real thing they are. Shauna: I’ve read your blog for a while now, but this was the most beautiful post and I had to respond. I was diagnosed with Celiac a year ago after years of illness. I was angry about the diagnosis in a really stupid way–I refused to be careful about gluten and continued to get sicker. But then, miraculously, I got pregnant. (Drs had told me it was a physical impossibility, given my health). Being pregnant changed everything, fundamentally and immediately. Now I was looking out for someone else. I was instantly hyperaware of gluten. (Thanks to your blog, the road was a little easier). The pregnancy was difficult, but my little man was born three months ago and, because of him, I’m healthier than I’ve been for as long as I can remember. I think he saved my life. So, my comment to you is, savor this, revel in it and tell us all about it. Its an amazing thing–sort of like making your own creme fraiche–you just can’t believe its something you could do. All the best. Shauna, wait to you teach Little Bean how to make butter! We ran a “full scientific experiment” in our home. Cold cream vs Warm cream…as soon as the two of them could sustain constant shaking action (10 minutes or less!). Warm cream became butter about a minute faster than cold, LOL. OH their joy! They still speak of it with loving memories. And of the natural buttemilk. We have revisited the experiment, too. With a “Good Seasonings” shaker cup and in just a tupperware cup. Thank you for explaining creme fraiche. I love it too, and avoid it too because of the cost. How simple! Now to make butter, and use the buttermilk to make fraiche! Oh yes…we also tested pasturized & homogonized vs non pasturized & homogonized vs non pasturized & non homogonized (i.e., raw). Raw won, hands down. Since we don’t own a cow (and live in the city, LOL) and raw creme is $10 a bottle, that’s one expensive cup of butter! FWIW, I don’t think Anon was being rude. I saw them as posting as thoughtfully as they could, expressing a true favoritism of your GF food blog and wanting it to stay that way. I’ve read through a lot of your older posts now. It is amazing how different it was before you met Chef. This is a beautiful time in your life. Your writing reflects it. Anon clearly appreciates it. ooooohhhh yummy I just now made this. it is so light and fresh and beautiful. perfect with a juicy pan-fried pork chop and a salad. and, I don’t know how you can have a whole jar of creme fraiche and not just sit and eat it. :p I kept adding “just a little more” so I could lick the spoon. What up gluten free giiiirrrrrlllll???? I thought of you and then followed up the thought with some actual inquiry and holy christ! “Things” have been happening with you. congrats on all of it. Much love till we cross proverbial or literal paths.